The article focuses on how the Portuguese arts have dealt with the Portuguese crisis, in the years 2011-2014, when the country was subjected to a financial bailout. The approach is based on a cross-section analysis, considering the domains of literature, fine arts, visual arts and cinema, music and performing arts. It emphasizes three distinct and complementary ways through which the relation between arts and society was developed in these years. The first way is the directly political positioning of artists, through artistic works and performances. The second way is the presence of the crisis as a background of several artistic creations of this time. And the third way is the one by which the crisis projects a new light into consistent topics of the Portuguese artistic imagination, stressing the centrality of collective identity and self-reflexivity. 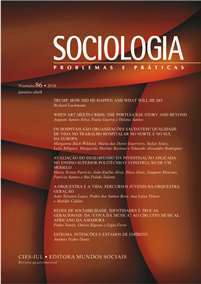 The Portuguese case suggests how promising can be for the sociological explanation of social processes the consideration of their cultural and artistic dimensions. Augusto Santos Silva is a Sociologist, Full Professor at the Faculty of Economics of the University of Porto (FEP). Researcher in the Institute of Sociology of the University of Porto (IS-UP). He is the author of several publications in the fields of Sociology of Culture and Arts, Sociological Theories and Methodologies, and Political Theory. Paula Guerra is a Sociologist, Assistant Professor of Sociology at University of Porto (FLUP), Researcher in the Institute of Sociology (IS-UP) and Invited researcher at the Centre for Geography Studies and Territory Planning at the Faculty of Arts, University of Porto (CEGOT). She is also an Adjunct Professor of the Griffith Centre for Social and Cultural Research (GCSCR) at Griffith University in Queensland, Australia. Helena Santos is a Sociologist, Assistant Professor at the Faculty of Economics of the University of Porto (FEP) and researcher at the Communication Sciences and Technologies Research Center of the University of Porto (CETAC.MEDIA).